Please note the N/B bus stop at Albert Place and the S/B bus stop at Croall Place will remain closed during the course of next week. For information, there will be some works to double-stack the site compound, although this will not affect the traffic or pedestrian management in place at Brunswick Road. Works will come to an end this week at the Iona Street junction in terms of the footpath slabbing, and final works to the junction surfacing as noted above. We continue working at Croall Place to accommodate the Scottish Water works required at this location, with surfacing and reinstatements of the footway commencing next week. Brunswick Street slabbing should complete today, with works on the opposite side of Leith Walk (outside the Library) commencing next week. Making good defective sections of the cycleway will commence next week, with isolated locations of pedestrian management set up to accommodate these works. Isolated worksites will be noticed between Iona Street and Brunswick Street where we continue to make good any defective works, and complete other critical Scottish Water works. The surfacing works continue to progress well, and remain on target for completion by the end of October. The remaining scope of the project is still on target for completion at the end of October, including the segregated cycleway and the 2-stage right turn for cyclists at the McDonald Road/Brunswick Road junction. See below for further information on the implementation of the 2-stage right turn for cyclists and the bus stop bypasses. This two-stage right turn will be the first of its kind in Scotland and will be open at the end of October. It has been successfully used in London and other European cities and allows people on bikes – especially less experienced cyclists – to turn right safely, without waiting in the centre of the junction on Leith Walk. 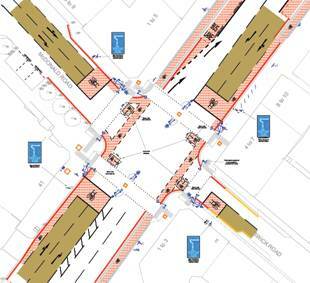 For example, cyclists travelling north on Leith Walk who want to turn right into Brunswick Road will follow advance signals at the traffic lights to be guided left into McDonald Road, where they’ll be given a further advance signal to cross Leith Walk into Brunswick Road. This is the image included in Mr Motion’s email. LCCC has asked him to supply a high-resolution version. At the end of October cyclists on Leith Walk will also be able to use around 700m of segregated cycle lanes on the east and west sides of Leith Walk between Iona Street and Brunswick Street. These lanes go behind bus stops, leaving space for bus passengers and will have clearly marked crossing points to allow passengers to cross to or from the stops. An animated film, produced in association with Sustrans, showing how both these improvements will work can be found here. A series of engagement events have been held throughout September to inform and gather feedback from the public on the proposed design for Picardy Place, which is intended to improve public realm, pedestrian and cycle infrastructure, and public transport integration as part of the St James development. Further engagement events will take place, with the first to be held in October, enabling the Council to explain how the design has evolved, discuss the feedback received to date and seek views from the public on how the design could be improved. A date and location for the event in October will be confirmed shortly. A final, detailed report on the design will be presented at committee in December, taking into account feedback received during the engagement process. Alongside the period of engagement, contractors are scheduled to begin enabling works in October, including the temporary removal of the Paolozzi sculptures and Sherlock Holmes statues in the area. However, this will not include any work on the construction of the new layout. Read the full report on the Council website. We will be in contact again in due course with further information on our plans. In the meantime, if you have any questions on the Leith Programme Phase 4 project, or any other information noted above, please contact: leith.programme@edinburgh.gov.uk. This entry was posted in News and Events and tagged 2-stage turns for cyclists, Albert St, Brunswick Road, Brunswick Street, Croall Place, Cycling, cyclists, Iona St, Leith Walk, McDonald Road, Picardy Place, roadworks, Scottish Water. Bookmark the permalink.